Let’s get one thing out of the way up front: Writer’s block is real. Everyone runs into walls, from the greatest novelist down to students who can’t stand the mere thought of writing because they think they’re no good at it. Writer’s block manifests as an almost tangible structure that stands in the way of writers and what they might express through the written word. At Don Johnston, our focus is on students. We love to see them become more effective readers and writers, and we’ve even developed some things that help them do it. One of them, Co:Writer, is something we’ll talk about in a bit. But first, the all-too-common-question: Is it possible for students who say they hate writing to pull a 180 and discover a love for it? We think so, provided you know how to overcome the hurdles. Consider the electric guitar. When someone decides to learn it, they’re promptly greeted by frustration and pain. Their fingers don’t do what they want them to do, and pinning strings to the fretboard hurts. A lot. That frustration and pain is not unlike what a new writer feels. They want to be good at writing. They want it to come easily. But it doesn’t, so they decide they hate it and give up. This is where parents and teachers come in. Becoming skilled in something creative (and loving it) really takes two things: desire and practice. When there’s desire, there’s motivation to practice. And when there’s motivation to practice, there’s improvement. And ultimately, fluency. Step 1: Unlock their desire to write by focusing on their interests. Every student has at least one thing they’re passionate about. Something that makes their eyes light up and words spill out of their mouth. And it pains us to say that that something is probably not the collective works of Nathaniel Hawthorne (no matter how wonderful his novels may be). If your goal is to show students that writing is fun and they should want to do more of it, a book report on The Scarlet Letter probably won’t get the job done. But identifying what they love and giving them assignments on it will. Whether they’re into gaming, fashion, sports, music, fantasy, mystery, or anything else, give them prompts related to their topic of interest. Step 2: Give them a little tough love with some old fashioned character-building advice. “The most pernicious aspect of procrastination is that it can become a habit. We don’t just put off our lives today; we put them off until our deathbed. Never forget: this very moment we can change our lives. There was never a moment, and never will be, when we are without the power to alter our destiny. This second we can turn the tables on Resistance. Frame that quote. Put it where your students can see it. Because even when they’re given the freedom to write what they’d love, they’re still going to want to consume it instead. Just like us. Consuming is so much easier than creating, but don’t let it happen. Point to the framed quote. Remind them about Resistance, and that defeating it is life-changing. Step 3. Help them practice with individualized writing drills. Fun fact: Basketball players don’t run non-stop full court scrimmages during practice. Instead, they practice smaller things that translate well to the next game. They run grueling wind sprints to increase stamina, they shoot free throws to work on their form and their focus, and they run intense box out drills to build toughness and get better at rebounding. On a related note, students don’t have to write complete stories every time they write. You can get creative with writing drills that you give them. For example, let’s say they struggle with feeling the rhythm of great writing. 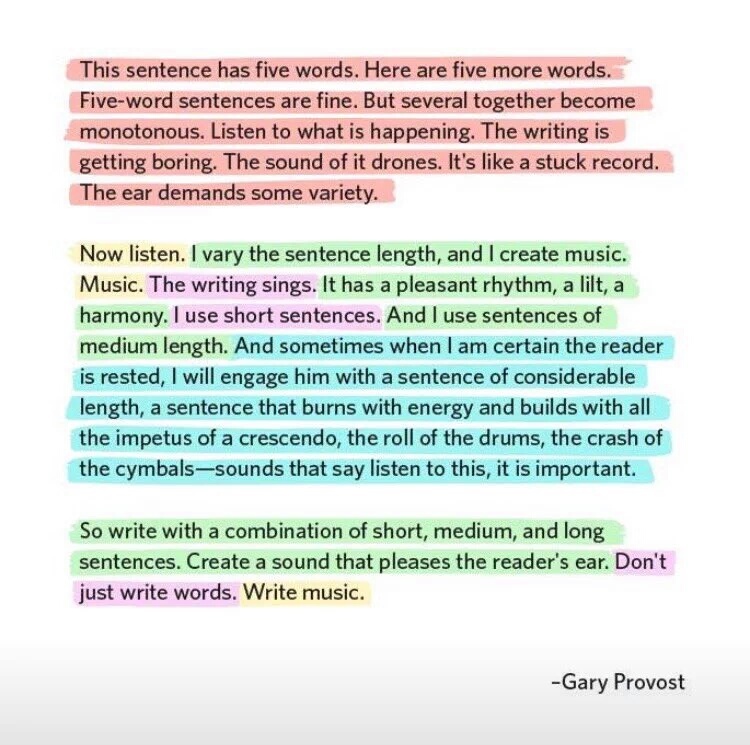 Give them a handful of different highlighters and have them use one color to highlight one- or two-word sentences, another color to highlight three- to five-word sentences, and so on. This drill is inspired by a famous example Gary Provost used when talking about the music of words. There are universal writing obstacles that punch every writer in the face. Including but not limited to fear that it won’t be any good, lack of vocabulary, lack of time, and writing about unfamiliar subjects. Ask yourself, “What drills might be fun to use here?” and take a few minutes to brainstorm. You’ll be surprised by what you come up with. Step 4: Consider Co:Writer as your writing practice wingman. As promised, here’s a bit more about Co:Writer. It’s a revolutionary word prediction tool that unlocks writing potential in every student. It does this through features such as predicting words and phrases that come next (even with phonetic and inventive spellers), hearing the word or sentence read aloud to know that you are using the one you want, translation, and more. It’s an intuitive way to help budding writers defeat that blinking cursor and gain confidence. All told, students have written over one billion words with Co:Writer, and they’re well on their way to a billion more. Knowing that makes us shockingly happy, because the written word is magic. It’s simultaneously a brilliant communication tool, a conjurer of every emotion, and a spellbinding portal to that next great story. The world needs more writers who love what they do and are confident in their skills. We’re so glad you’re building them up. Oh! Almost forgot this part. If you take us up on that writing drill challenge and use some to help your students practice, please let us know about it! We’d love to hear the details on what you came up with.